PLUTO PETITION: A strange thing happened on August 24, 2006. After years of debate, the IAU finally settled the question of Pluto, declaring it is not a planet. The strange thing is, people won't stop debating. Here's your chance to join the fray: Sign the Pluto Petition. BIG FULL MOON: Can't sleep? It must be the moonlight. Tonight's full Moon is the biggest and brightest of 2006. What makes it big? Answer: The Moon's lopsided orbit. One side of the Moon's orbit is 50,000 km closer to Earth than the other side. 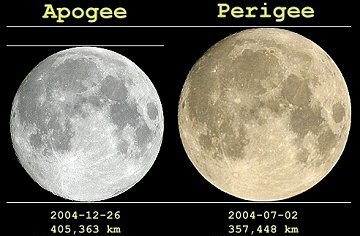 The two sides are called, respectively, perigee, from Greek, meaning "close to Earth," and apogee, meaning "far from Earth." Tonight's Moon is at perigee. To illustrate the difference, apogee vs. perigee, Anthony Ayiomamitis of Athens, Greece, took these two pictures when the Moon was at opposite ends of its elliptical orbit. The perigee Moon is about 12% larger. EXTRA! Tonight's wide Moon is going to glide through Earth's shadow, producing a 90-minute partial lunar eclipse visible from eastern Europe, Asia, Africa and Australia. Only 19% of the Moon will be in deep shadow, but that's enough for a pretty display. Maximum eclipse takes place at 1851 UT on Sept. 7th: animation. That's not all. 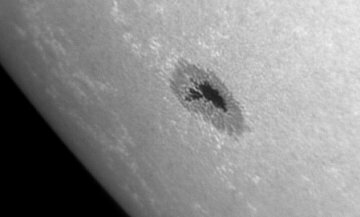 Two more sunspots are rapidly emerging just ahead of sunspot 904. "They looked spectacular yesterday through the eyepiece of my H-alpha telescope," says Mike Taormina of Palatine, Illinois: image. The new sunspots are growing rapidly, so stay tuned.